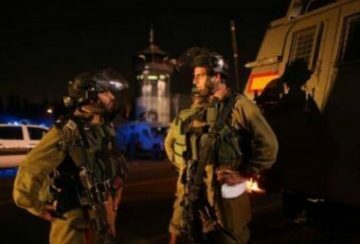 Israeli soldiers abducted, on Thursday at dawn, six Palestinians, including two teenagers and a female legislator, in the southern West Bank district of Hebron, during invasions and violent searches of homes, the Hebron office of the Palestinian Prisoners’ Society (PPS) said. The PPS stated that several army vehicles invaded Shiokh town, east of Hebron, and abducted Samira al-Halayqa, 53, from her home. It added that Halayqa, a democratically-elected legislator, was taken to an unknown destination after the soldiers confiscated her computer. In addition, the soldiers invaded and searched homes in Beit ‘Awwa town, southwest of Hebron, and abducted Mo’tasem Farouq Masalma, 17, and Mahmoud Raed Masalma, 16. The soldiers also invaded and searched homes in Hebron city, and abducted Rami Edrees, Majed al-‘Ajlouni and his brother Morsi.